Last year we saw the development of a very interesting and unusual handset type: curious-looking models intended for serial production and mass sales. Examples include the Siemens Xelibri series, the "pen-a-phone" Haier line, other models of an unusual construction or form-factor, and finally, Nokia 7600. Such handsets provoke mixed feelings in customers. In theory, the design is given a positive evaluation, but in practice, the customer has doubts (well-grounded, as a rule) whether such model is handy and really suits his lifestyle. It is only well-to-do people that can afford buying a curious phone just for kicks. Industrially speaking, these handsets were initially planned to be sold as technologically simple but high-profit products and to introduce a fashion mechanism that would force customers to buy new models more often. But now it has become clear that this trick doesn't go down too well, and odd-looking phones are produced for two purposes: to try new constructions and form-factors, and to demonstrate the company's creative potential. Thus, such handsets can be called image phones, meaning the manufacturer, not the customer. Technically, Nokia 7600 is the company's first two-system handset (2G/3G) that can work in GSM 900/1800 and WCDMA. The model also supports standard 3G services, such as streaming audio and video playback, and has a 29-MB built-in memory. 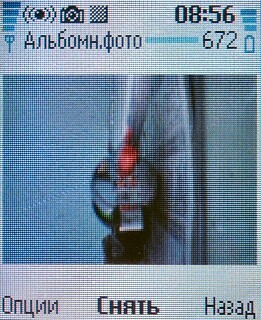 Nokia 7600 looks quite uncommon, as can be easily seen from the photos. It is not minute, but not huge either: it measures and weighs about the same as Nokia 6600. The handset is supposed to be worn as a pendant, and it has a little hole for a neck band. Although it seems a bit too big for a pendant, it looks more like a pocket-size device. Its body is made of a usual plastic which is not exactly bad but looks nothing grand either. The keypad is divided into two rows each placed along the side of the display, and should be handled with both hands. A similar solution was used in the Siemens SX1 smartphone, but in our opinion, it is better realised in Nokia 7600. The keys are situated farther from the display so your thumbs won't be covering it all the time. Besides, due to a certain distance between the keys and the edges, you can hold your hands in the customary position and handling becomes more convenient. The drawback of the construction is the unusual position of the keys, which takes quite a while to get used to. Apart from the numeric unit, the front panel also has call and cancel keys, two soft buttons and a 5-way joystick. The keys are easily discernible by touch, but their uncommon arrangement makes "blind handling" virtually impossible. At least, we didin't manage to get used to it during testing. The keys are rather tight, not easily pressed, have a small depression and a vague tension. The only exception is the soft buttons made as a single tilting key with a larger depression. The joystick, too, has its problems, though not so serious: the button is not big and sometimes when you want to press it you get a tilt, and vice versa. Although that won't happen with a bit of concentration at handling. 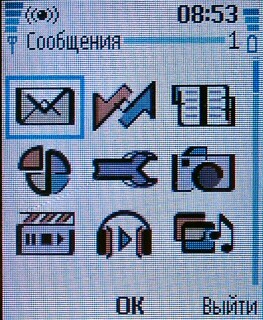 In addition to the main key unit, there is a double scroller button on the left-hand side, which is mainly used for volume controls, and also a useful dictaphone key, long absent from Nokia handsets. 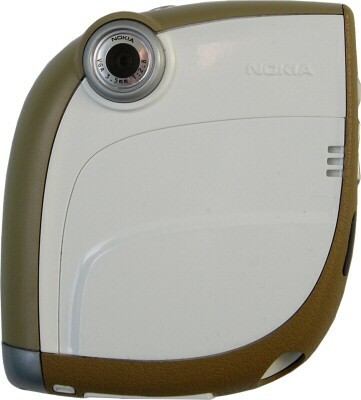 The upper side has the camera's shooting button (to the right) and a power-off button (to the left), tight and deeply sunk, typically for Nokia. Besides, there is a camera objective on the reverse side. It juts out, has no protection and is therefore badly exposed to damages. The IR-port is on the left side, the lower side has a Pop-Port and a charger plug socket. The speakerphone is situated in the upper left corner, the microphone is in the lower right one, though right on the verge, closer to the lower side. Ergonomic tests show that the handset is the most handy when you hold it in your palm before yourself (a natural position for a videophone). Another natural grip is typical for holding a camera: the phone is held in both hands with the right forefinger on the shooting button and the thumbs on numeric keys. A large width and a square-like shape make this grip more handy than in the case of Siemens SX1. But the traditional phone grip is inconvenient as the handset has to be placed diagonally. 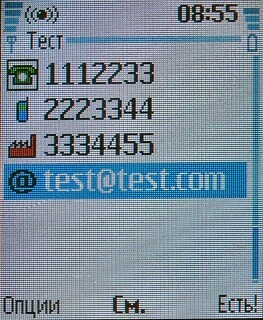 The 7600 display has a 128x160 resolution, unusual for Nokia Series 40 (128x128 being a standard one). This is a TFT display, and it supports 65,535 colours. It has little difference from most similar screens; its brightness, contrast, and richness are standard, and the display has relatively large pixels. However, it does have a particular feature: the display's reflecting properties are very high and increase its legibility without backlight and in the sun. Thus, with the backlight out and the digital clock screensaver active, the display has about the same contrast as an average monochrome screen. And a colour image in a reflected light is more discernible than usual. The photos you see here are made in direct sunlight and with no backlight. 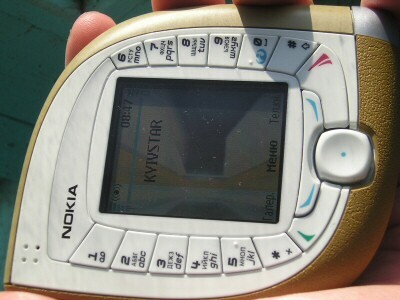 The model is supplied with a standard Nokia BL-5C Li-Ion battery. The construction of the battery cover is quite original. To open the battery compartment, you have to start with the plastic side cover which opens from the upper left corner. When you're through with it, the main cover can be removed. The battery is held in the socket by the friction force, although it is quite reliable. 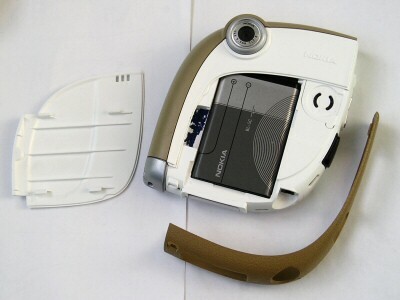 The SIM card slot is situated in the left wall; the card is inserted horizontally. To close the battery compartment back, the reverse order is used: you put the main cover in its place, then fix the side cover to the juts near the microphone and the info connector, and snap shut the jut on cover's edge. The construction has no backlash and emits no squeaks. 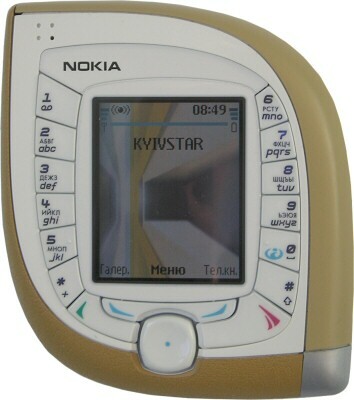 Nokia 7600 is based on the latest edition of the Series 40 platform. 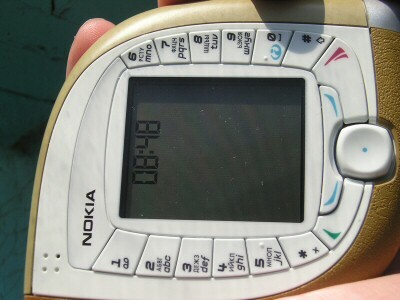 The user interface, despite being traditional for Nokia, also has a number of innovations. For instance, the main menu can now be shown as an array of icons (without captions). The array consists of three columns and six lines, only three of which can be displayed at a time. Confirmation is now done by pressing the joystick. In some cases it duplicates a traditional soft key function, in other cases it is the only way to execute a command. The context menu is invoked with the left soft key. The model has an extended address book that enables to apply up to five phone numbers (general, home, office, mobile, and fax) and four text fields (e-mail, URL, home address, and a note) to a subscriber. In case each entry contains three numbers and one text field occupied, you can store up to a thousand entries. 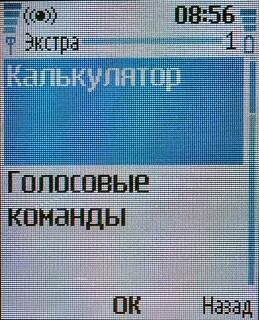 The phone has a single list of entries from the address book and the SIM card, but you can select a separate mode that shows only one of the types. There are five pre-installed groups for subscribers. The latest platform edition enables to voice-dial the numbers, even the ones from the SIM card memory (which is not so frequent). You can also supply a subscriber with a photo or a picture that will be shown at his call. Besides, the phone supports Presence services. This function that provides other subscribers with information on whether you are available or not, requires support from your operator. It can include both basic ICQ-like status identifying services and information services. Presence options enable to allow/prohibit the use of this information and to create "black" and "white" lists of subscribers. 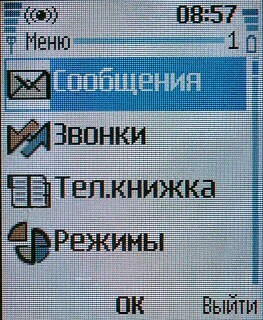 Messages comprises options concerning SMS and MMS messages and e-mail. The phone has an SMS chat and in contrast to the first Series 40 generation, it supports multi-paged MMS messages. Calls contains lists of incoming, outcoming, received, and rejected calls. It also has meters of call duration, price, traffic volume, and GPRS-connection duration. Mode provides the access to profile settings. The curious thing about Nokia profiles is that they can be set for a certain period and then will be automatically deactivated. Settings includes standard settings, such as menu language, display properties, dial and security options, time, date, etc. Camera is arranged as a separate menu item. The submenu provides a direct access to the selection of a shot orientation, after which the viewfinder window acquires either a landscape (Standard) or a portrait form. Self-timer and night-shooting modes are invoked in the same way. Apart from standard shooting options, you can record videos in 3GPP format with a 128x96 resolution and sound. The maximal shooting resolution is 640x480 pixels, and the quality of the shots is typical of built-in cameras. Video length is limited by the memory size, and the quality is not very high: digital compression artefacts can be noticed even in a small handset display. Mediaplayer gives a quick access to the media files stored in the phone memory, but it is mainly designed to load and play graphics, music, and video, as well as to play media in the streaming format. But because Russian providers do not support streaming data, this menu item, in fact, duplicates other analogical multimedia options. Music contains an MP3/AAC player that plays music files from the phone memory. But actually, this function has no practical value, as 29 MB are not enough for a quality MP3 player and removable memory cards are not possible to use. 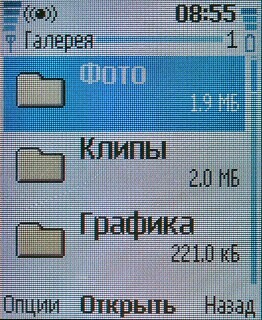 Gallery is a regular Series 40 media browser made as a file manager. It enables to view files with images, photos, videos, ringtones, and digital music. 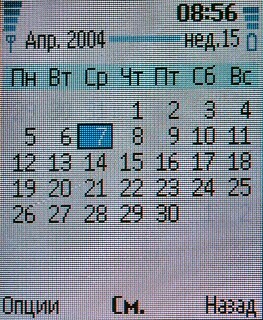 Organizer contains a simple alarm-clock (momentary mode only), a calendar, and a primitive calculator. A so-called "e-Wallet" is also here. Games allows to handle game Java midlets stored in the phone memory. You have to select this folder when installing various games (the phone supports no other game applications). You can also load new programs here launching the WAP browser directly from this menu. Aplications includes Java business programs. Extras comprises calculator (serving as one more link to the program), voice control settings, a countdown, and a stopwatch. Connectivity contains commands setting Bluetooth connections, IR-port controls, and GPRS parameters. Active opens a fast access menu that can also be reached by pressing the right soft button in the standby mode. 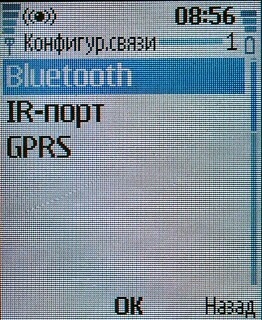 The phone interface supports Russian and Ukranian, and there are also versions with Latvian, Lithuanian, and Estonian. Russification and ukranisation are not bad, though some translated items might seem a bit unusual. Nokia 7600 ensures a good connection quality, which is no surprise because of a standard platform. The model has a 24-tone polyphony (against 4 to 16 tones in other Nokia phones). The synthesizer supports MIDI format and ensures a high sound volume. The vibrocall is powerful; it has a medium frequency and a large amplitude. Most vibrations are generated in the lower part of the phone, they go from the front to the reverse side and back. Vibration in the sides is not so strong, and is still weaker in the upper part. But the buzz it creates is loud enough. Our impressions from Nokia 7600 depend on whether we assess it rationally or emotionally. In general, the handset looks good if we regard it as a work of designers' art, but it's not always handy to work with. 7600 is made in a youth, even teenager style. Twenty-something respondents, though approve of its original design, will hardly chose this phone for themselves. Rationally speaking, the estimate is negative: in this case, you always have to sacrifice something for the extravaganza, and ergonomic drawbacks are rather serious. For these reasons, a practical customer is very unlikely to spend money on 7600, although it is quite good, technically speaking. But in his eyes, the phone's extensive functionality and some unique features will hardly get the better of its design. Thus, the target group of Nokia 7600 narrows down to the kind of customers who are ready to buy a handset with such design not only despite rational arguments, but rather in defiance of them. In fact, people can buy 7600 as a toy, just out of curiosity. And considering the handset's high price, only well-off people can afford it. But because these two conditions are seldom met together, the most probable variant seems to be rich relatives buying the phone for their teenage kid. In the end, our initial suppositions are confirmed: Nokia 7600 can hardly count on mass sales, and the company seems to be well aware of the fact. But it is more important for Nokia to know that it can produce advanced, unusual, conceptual, functional products, and what is more — that it can afford producing them on the industrial scale, in contrast to other handset manufacturers.